First Blood. Elcajo Productions 1982. The problem with Sylvester Stallone’s franchises is that they were really never meant to be franchises. But then I say that having never seen any of the Rocky or Rambo sequels. However, I get the sense that the Rocky movies did better at retaining its emotional center than Rambo. As I understand this, the original Rambo film is a fairly faithful telling of a story contemplating what happens to Vietnam veterans with difficulty adjusting to civilian life (in this case, get triggered and start shooting people), while the later movies recast the character as a warrior put in contexts that need a warrior for the sake of letting him shoot more people. So I expect this one to be thoughtful on a level somewhat beyond a typical gritty action movie. Stallone gets typed as an action star, but it’s clear from Rocky that he can portray human vulnerability, and I hope to see that on display here in the pacing scenes. Teasle, the sheriff of a small town in Washington state picks up a passing drifter and makes it clear that the drifter is not welcome in quiet, peaceful town, even to get a bite to eat and be on his way. Teasle drives the young man to the edge of town and drops him off, only to have the man start walking right back into town. So he arrests him. The deputies processing him are similarly prejudiced and openly cruel, triggering flashbacks of torture in a Viet Cong prison camp, to the point that the vagrant freaks out, overpowers every deputy in the building, and escapes into the forest. Teasle calls out a manhunt for John Rambo, decorated Green Beret, who is more than capable of defending himself in a war he never asked for. It’s hard to tell if the cartoonish prejudice of the sheriff’s department is strictly overkill in service of making Rambo a sympathetic character or if it’s a more serious representation of civilians heaping their displeasure with the war in Vietnam upon the soldiers tasked with carrying it out. Teasle’s own vendetta has motivations that approach plausibility, but they’re born entirely from an arrogance in the way he runs his town. Wearing an army coat marks Rambo as a bum to Teasle, but that’s it. Nobody else seems to directly cite war objections either, though some of the deputies delight in handling him roughly before he escapes. Rambo’s problems seem to be more symptoms of what the war did to him and others, rather than what others thought of the war. The rapid escalation is similarly implausible, but it’s exciting and nowhere near the levels of gratuitousness the franchise gets lampooned for. The sheriff’s department getting overwhelmed and having to call in the state police is one thing, but somehow it goes to calling out the National Guard against a soldier armed with survival training and a knife. 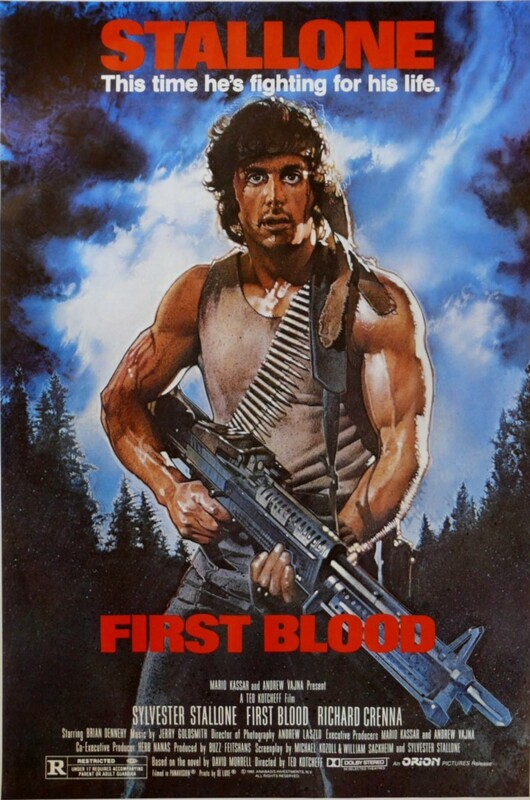 As far as this movie is concerned, I think I like Stallone’s portrayal of Rambo better than Rocky. Looking over the summaries of subsequent films, Rambo is indeed turned into a one-man A-Team for the purpose of having more story to tell, but this is both engagingly meaningful and excitingly explodey, satisfying on two levels rarely paired. I was sure Richard Crenna, who plays the Colonel who trained Rocky, in something before, (He seemed to remind me of a regular on I Dream of Jeannie), but nothing in his filmography looks familiar. I found his performance particularly interesting, even beyond trying to place him. He’s the main thing that looks interesting about the sequels. Similarly, Teasle gets a layer of humanity underneath his cartoon arrogance that’s probably very much a credit to Brian Dennehy. it’s unfortunate that the end of the movie isn’t the intended ending, as I found the idea that someone finally lets Rambo talk about what he could never say before poignant and a terrific demonstration of a message about Vietnam vets come home. It takes some leaps to merge the meaning with the action, but the combination is quite an experience. Sad to see the franchise and the actor reduced to a type since. sounds like a remake is called for. i think the climate of the times now would allow the ending you like. My first thought was that it couldn’t be made with an Iraq War veteran because this is so much about what happened to Vietnam vets when they came home. Antiwar sentiment made them pariahs on top of their own war-induced problems. But veterans still come back with mental illnesses and social adjustment issues that can cause them to become homeless, and if somebody with training like that flipped out on a small town sheriff’s department, it would probably provoke an antiterror response. So the escalation would be more realistic.